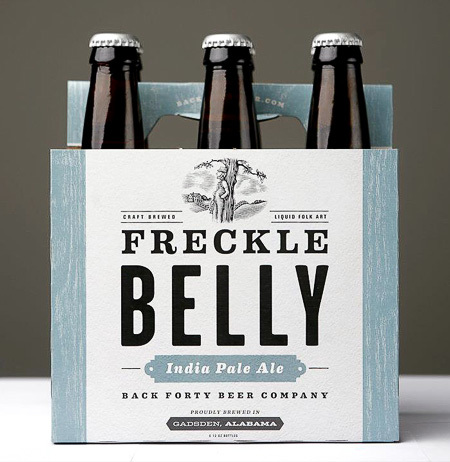 Back Forty in Gadsden is one such brewery to quickly make a name for itself. Their name derives from an old agricultural term that refers to the 40 acres of land situated furthest from the barn. This land was often overlooked as it was the hardest to maintain- hence, land that is now rich and feritle. At Back Forty, they've utilized this soil to create five incredibly tasty microbrews, along with a few seasonals. Back Forty is smartly packaged and embraces their southern heritage. As for naming Fence Post Session Ale, they state- "Fence posts have been used for centuries to keep people apart. But in the Deep South, fence posts bring people together. They're a place where neighbors and friends can take a break and chat for a while..."
Brothers, Coby and Hunter Lake founded the brewery just last year and offer five beers year round, as well as some seasonal favorites. All their beers are named after popular folklore of Avondale, Alabama. I personally like their Vanillaphant Porter Ale, named after Miss Fancy, the elephant who found a home in Avondale Park after being offered to the town by a down on his luck circus owner. This ale has the traditional flavors of chocolate and roasted nuts, with the added touch of vanilla. Yes please.